“Interstitial Castings” are negative space castings of people engaged in choreographies of the intimate. They are the interstitial space between two people engaged in iconic gestures like air-kissing, or pushing one another. Since first experimenting with this process I have built 3 series of Interstitial Castings, the sculptures from Guapamacataro are the first. They are three castings of the intimate gesture of listening. One is of Roberta as she leans in to talk to Iain, another is of Nicholas as he whispers to Juan, and a third is the Residency director, Alicia Marvan, listening to the walls at her favorite place at Guapamacataro. “Siren I” is an interactive sonic installation that uses viewer’s movements through space to change a soundscape. As viewers approach the sculpture the soundscape’s volume changes and the melody dissolves into distortion. The soundscape is composed of performances by experimental music duo Siti Bauw. A sample of the undistorted audio can be heard here: https://soundcloud.com/liz-lessner/siti-bauw-pretty-mix. My sculptures and installations enact the places where culture and social norms influence the ways we navigate and perform intimacy. 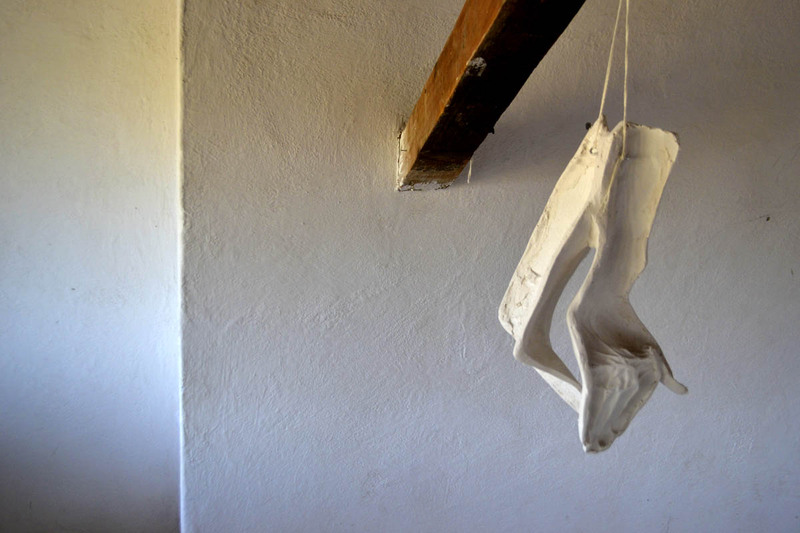 These sculptures consider social feedback loops, popular narratives of desire, as well as mythology and nostalgia and the fetishism that both imply. They range from objects to installational sculptures that are augmented by the viewer’s performance. These performative installations imply the body or its placement and ask the viewer to physically interact with them. In this work the viewer becomes a graphic part of the sculpture while also having a unique and personal experience of it. Gesture is the fulcrum around which this work revolves. I am influenced by Lygia Clark’s Sensorial and Relational Objects which use ritualized and focused gestural performances to reframe the processing of memories, inter-personal interactions, and conceptions of self. I use four methods that reference gesture to engage the viewer’s bodily attention: representation, enactment, interaction, and responsiveness. By repeating and reframing iconic gestures these works find new ways of representing and experiencing the ephemeral psychological and spatial dynamics of interacting with others. They seduce through materials and form, prompt consideration through user experience and sensorial awareness, and create, as Nigel Thrift says, ‘new and more productive entanglements’ by activating sticky and paradoxical spaces of negotiation and intimacy. Liz Lessner is a NY based sculptor and installation artist. Lessner has had solo shows at Big Orbit, a Center for Exploratory and Perceptual Arts Gallery Project Space, and The University at Buffalo Visual Studies Gallery, and The University of Oregon’s Eric Washburne Gallery. She has exhibited her sculptures and installations nationally and internationally including the Guapamacátaro Center for Art and Ecology in Michoacán, Mexico, Brooklyn Artist Gym, and the University at Buffalo Anderson Gallery. Highlights include the two-person show “Common China” at 3rd Ward, Brooklyn as well as the group shows “The Man I Wish I Was” at A.I.R. Gallery in Brooklyn, New York and “Amid/In WNY” at Hallwalls in Buffalo, NY . She has an MFA in Media Study: Emerging Practices from the University at Buffalo’s Department of Media Study.